The population boom hasn’t happened yet, but Ridgeland officials are laying the groundwork to expand its services when it does. The Town Council last week chose a site for a new fire station, committed money to re-activate an old well and told town employees to pursue funding for a sewer project. Ridgeland has grown from two square miles to 45 square miles over the past several years, said town administrator Jason Taylor.Its population has stayed between 2,500 and 3,000 people, but there are enough permitted developments waiting in the wings for the population to explode tenfold. Developers of a 1,200-acre business park they tout as one of the best-situated sites in the Southeast are now marketing their first 300 acres in southern Hardeeville. Because of the tract’s logistical advantages, marketers expect to sell it for a warehousing and distribution or industrial project by year’s end. The business park accounts for about a third of the 5,000-acre RiverPort owned by the Stratford Co., a Dallas land investment group. Plans to build an exit on Interstate 95 that some hope will usher in a wave of economic development in the Lowcountry got a boost Tuesday from the bi-state agency charged with developing a proposed port in Jasper County. 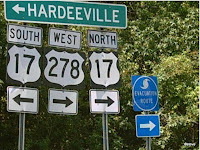 The board of the Joint Project Office endorsed an effort by Jasper County and Hardeeville officials to apply for more than $68 million in state money to create Exit 3, which would lead to Hardeeville. Although the proposed Jasper County port remains years away, Hardeeville officials aren’t waiting to court new business. As plans develop for the port and a proposed Exit 3 on Interstate 95, the city is marketing itself as a potential home for both industrial and commercial interests. Hardeeville is poised for substantial growth with or without the new exit and port, said Ted Felder, the city’s economic development director. Proof of that has already arrived in the form of AGM Imports, a marble and granite distributor developing a 30-acre parcel on U.S. 17 near S.C. 170. The company is building a 100,000-square-foot distribution center on seven acres and plans to subdivide the rest into eight lots for sale to other firms. A 300-acre shopping center planned in Hardeeville moved closer to reality Thursday when the city established a plan to finance improvements in the area, among them roads, sidewalks and a sewer system. 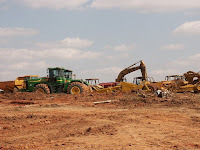 The Okatie Crossings project is designed as a regional, open-air mall that will include about 1.2 million square feet of space at the intersection of U.S. 278 and S.C. 170. Representatives from The Sembler Company, the project’s developer, declined to discuss potential tenants. With the ongoing recession battering the container industry and decreasing traffic at ports around the country, it could be 15 years before demand is strong enough to garner permits for the proposed Jasper Ocean Terminal, engineers studying the feasibility of the project said Friday. Representatives from the Moffatt and Nichol engineering firm said it also could take that long to complete environmental and economic studies and develop an adaptable, working plan for the 1,518-acre, deep-water container port. The Jasper County Chamber of Commerce has launched its Web site for the South Carolina-Georgia joint deepwater marine terminal on the Savannah River, just south of Hardeeville, S.C. The Web site, by providing updated reports and breaking news on the marine terminal development, will actually help “positively facilitate the growth and movement forward of this port project,” said Sauls, who is a member of the Savannah River Maritime Commission. “The Jasper County Chamber will work closely with other area chambers, the Lowcountry Economic Network and our legislators to keep the public and business community informed of the port’s progress, as well as work on initiatives to help our businesses prepare for the coming positive growth of the local economy due to the port,” Sauls said. According to the new Web site, “The Jasper Ocean Terminal will be a new container port on the South Carolina side of the Savannah River. The port will be jointly owned by South Carolina State Ports Authority and Georgia Ports Authority and both states stand to benefit economically from the activity of this project. The S.C. State Ports Authority has approved providing $3 million of additional funding to the Joint Project Office (JPO) for the development of the Jasper Ocean Terminal, located on a 1,515-acre parcel of land formerly owned by the Georgia Department of Transportation. Preliminary market studies place the port’s potential impact on the area’s economy at $2.3 billion. A new Holiday Inn Express & Suites in Hardeeville is just the start of commercial growth near the city’s portion of Interstate 95 that will include several hotels and restaurants, according to the developer and city officials. Officials toasted the grand opening of the 76-room, $6.5 million hotel Tuesday morning. The Holiday Inn — developed by Sega Management of Statesboro, Ga. –is north of U.S. 278 between Interstate 95 and S.C. 17. But the facility is just the start of what Sega Management wants to do at its Exit 8 development called Hardee Station. The company has another 48 acres behind the Holiday Inn — land that could have as many as three or four other hotels, a handful of fast-food and sit-down restaurants and a strip retail center. Sega plans to start construction on a Hampton Inn within the next 120 days. Other parts of the development — the restaurants, retail space and other hotels — will occur as Sega finds the right fit for the development, said Michael Bowen, a partner in Sega Management. A $150 million commercial and residential development is planned for Hardeeville that will span 170 acres and eventually add 1,000 jobs, according to the developers. Tetra Companies LLC, based in Virginia, plans to build 820,000 square feet of retail and office space and about 320 apartments. For size comparison, The Mall at Shelter Cove on Hilton Head Island has 274,000 square feet of retail space. City and developer estimates indicate the project, called Crescent Centre, will be completed in 2014 near Exit 5 off Interstate 95 at U.S. 17. Tetra owned 40 acres in Hardeeville, and the city has agreed to sell 130 acres from what is now called the Hardeeville Commerce Park to the developer for roughly $2.8 million. “It all just really came together — the exposure to I-95, the size,” said Eric Vannier, a director with Tetra. “We look around all the time at interstates” for new developments. The location will capture both travelers coming north from the Savannah/Hilton Head International Airport for a vacation on Hilton Head and those traveling south on I-95 to spend time in Florida, Vannier said. While Tetra has visions of a bustling shopping corridor, Hardeeville envisions a boost to its tax base and a spur to new development. Some of the proceeds from the sale of the city land will go toward creating a public-private Economic Development Alliance, a nonprofit group that will purchase properties and market them for industrial and commercial purposes, said Ted Felder, the city’s economic development director. The city and the alliance, which is expected to be formally created in the coming weeks, plan to buy land west of Crescent Centre for an industrial park, Felder said. With the revenues the commercial and retail development adds to Hardeeville’s tax base, the city will be able to offer tax incentives in the future to lure industry, city officials said. Those incentives are almost always necessary to bring in high- paying industrial jobs, Felder said. Vannier said construction should start in early 2009. There are questions about how the national economic slowdown might affect the national retailers’ building plans, but Vannier is confident the Hardeeville location is so desirable that retailers will make it among their priorities for new store construction. The Tetra development is not related to a $61 million deal announced last week to develop 5,000 acres in the city into an industrial park. A Beaufort County developer closed Thursday on a $61 million deal to develop 5,000 Jasper County acres into an industrial park fed by a future shipping port on the South Carolina side of the Savannah River. 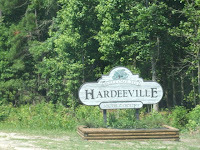 The land, known as the Hardeeville Tract, is bound by the Savannah National Wildlife Refuge on the west, crosses Interstate 95 to the north and U.S. 17 to the south. Billy Gavigan, a broker for the deal who represents the private equity fund and owns Citadel Realty, said 2,000 acres will be used for industrial development. He said the remaining land will be residential or commercial. The deal is one of the first projects that Jasper County has seen that can be directly attributed to its strategic position near the future bi-state port in Jasper County and the Port of Savannah, both on the Savannah River. The land was selected because of its proximity to the Port of Savannah and is less than 6 miles from what will be the $450 million South Atlantic International Terminal Port in Jasper County.The new Jasper port is a venture with Georgia and will be overseen by a bi-state port office. It is expected to open in seven to 10 years. The buyers were not identified by the broker because of a confidentiality agreement between the buyers and landowner John Reed. The buyers are represented by Citadel, Gateway and McVay Realty, said Gavigan. “With the emergence of the new port, the property should be one of the biggest things to ever happen down here. It’s our intent (with the development) to create jobs for the South Carolina side,” he said. Investors have shelled out more than $364 million for economic development on the Georgia side of the Savannah River in anticipation of the joint shipping port. “With the growth and emergence of the port this is a logical industrial buy,” Gavigan said. He said the developers are hoping the location will make access to the port, CSX railroad and highways easier for international companies that build hubs on the site. There also is maneuvering under way to secure money for a new exit — Exit 3 — off Interstate 95. “The city has made it its No. 1 priority,” said Ted Felder, Hardeeville’s economic development director. The new exit would provide a permanent hurricane evacuation route and alleviate some of the daily traffic, Felder said. Felder said the project is on the S.C. Department of Transportation’s Statewide Transportation Improvement Plan. Staff for U.S. Rep. Joe Wilson, R-S.C., confirmed that there are plans to create a new exit. The planned port, which will be the second largest port in the nation when finished, will be a huge impact on our state. Savannah has already capitalized on the plans, since they have the infrastructure in place. It is imperative that South Carolina makes a firm commitment to build the infrastructure necessary to support the growth.